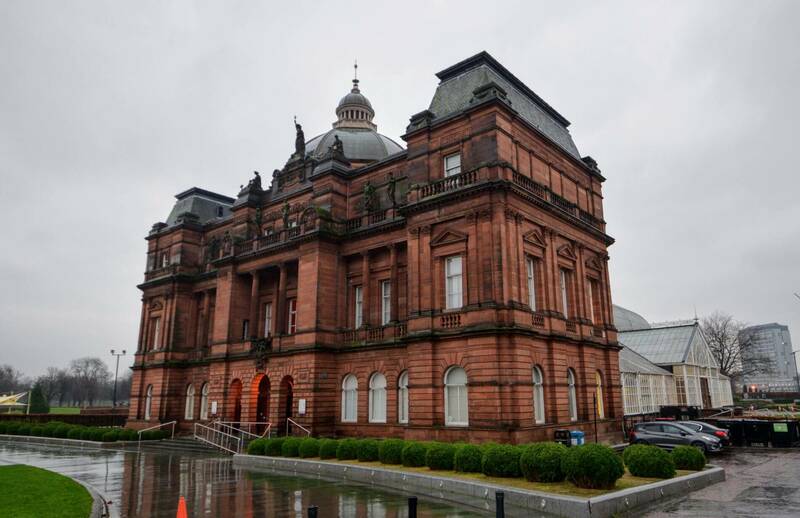 Glasgow is Scotland’s largest city, lying on the River Clyde. People from here are known as Glaswegians. It’s a more trendy, modern, industrial place compared to Edinburgh. 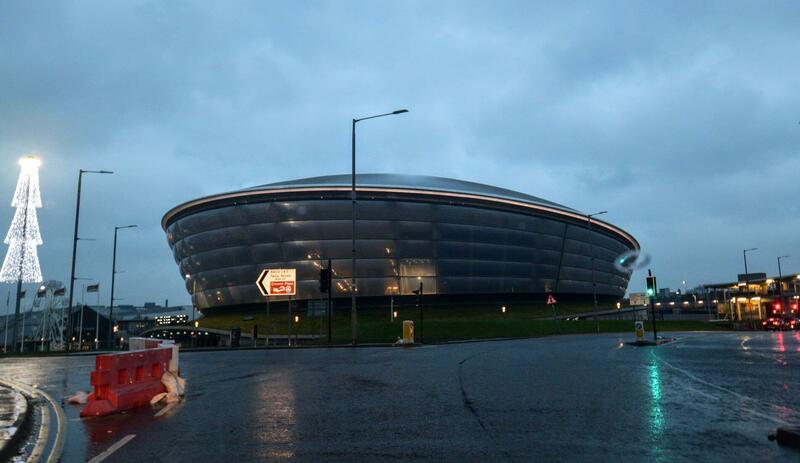 We drove to Glasgow from Edinburgh with a rental car. Only 1 hour driving. Check out our full day in Edinburgh here, or our 4-day Scotland trip. 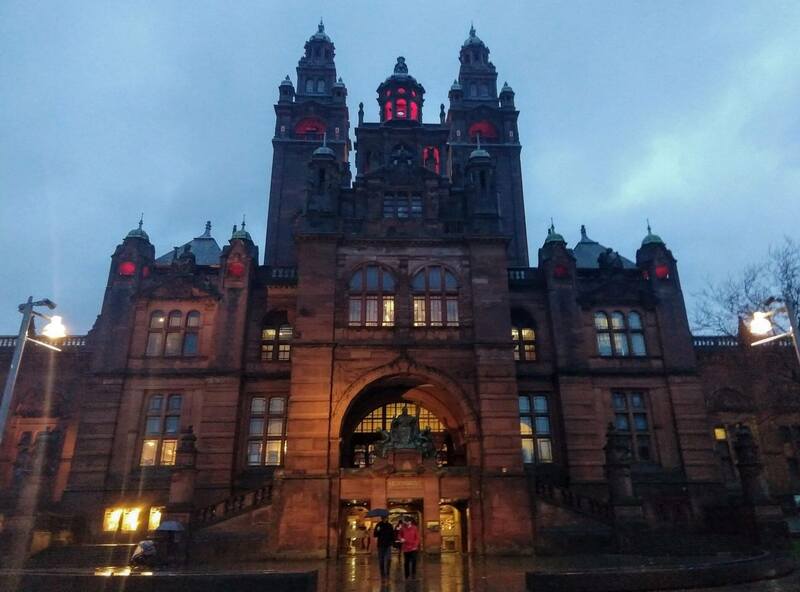 Our day in Glasgow was pretty rainy with cold temperatures, so always be prepared with an umbrella or poncho, and something dry to put on. We didn’t really discover the center until later in the day because we started with the sights on the outskirts of the city first. 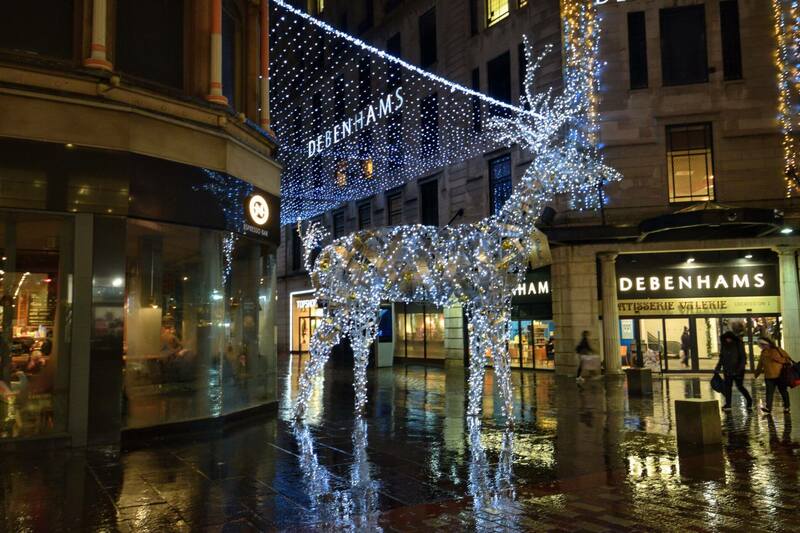 Here’s a winter day itinerary for Glasgow. We parked in the cathedral district first and had a look at this medieval beauty. Go inside for free too. Right next to it is a large cemetery called Glasgow Necropolis, which is worth checking. Unfortunately we were looking for a toilet after seeing the cathedral and never made it up there. We stopped for a delicious espresso and flat white at McCune Smith Cafe though! 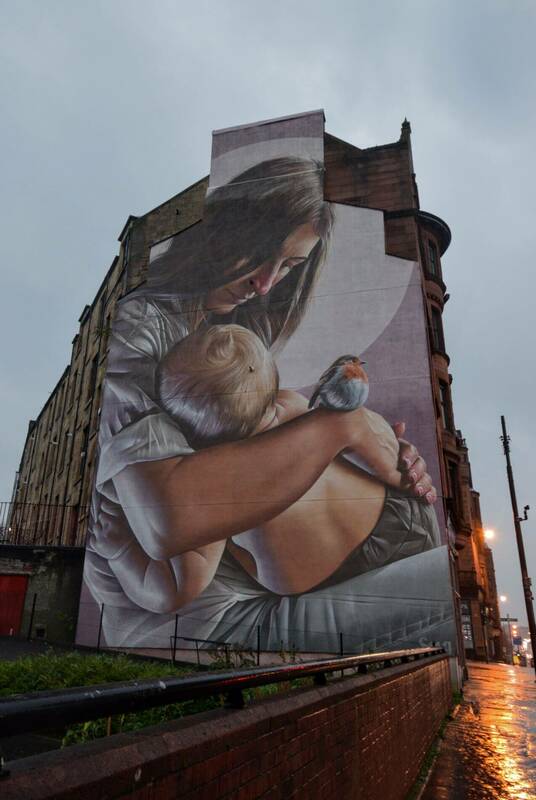 We found this on the way to The Barras Market, and saw it in the middle of a road. 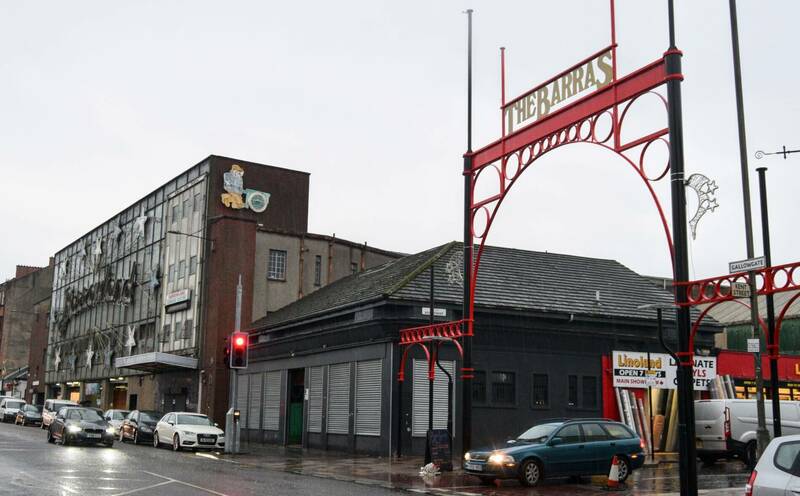 It’s in a place known as Glasgow Cross, which was a meeting point for many important streets back in the day. 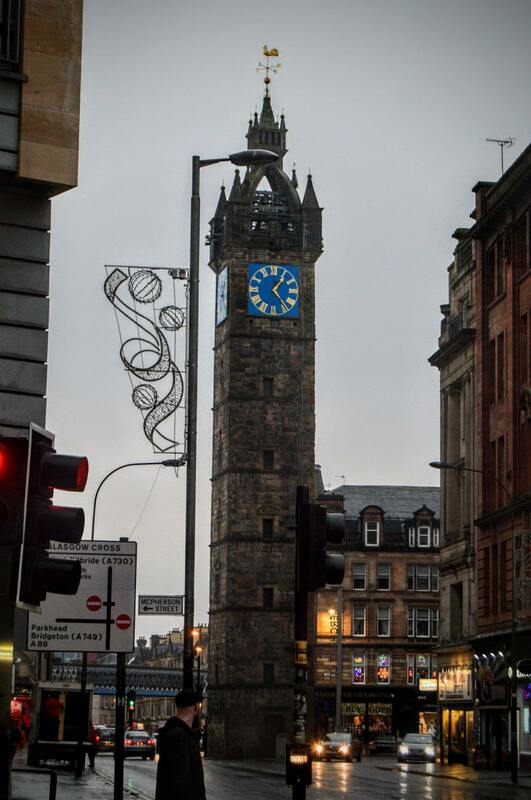 This steeple is what remains of the original Tolbooth buildings which was a place containing the town hall, etc. An old market in the East End, similar to a flea market, and only open on the weekends. It happened to be Saturday when we were here. There are some places selling food too. We ended buying me some hiking socks for myself to stay warmer and a souvenir plate for Glasgow that we have been collecting at each destination we visit. The People’s Palace, is a beautiful building and another free place to enter. 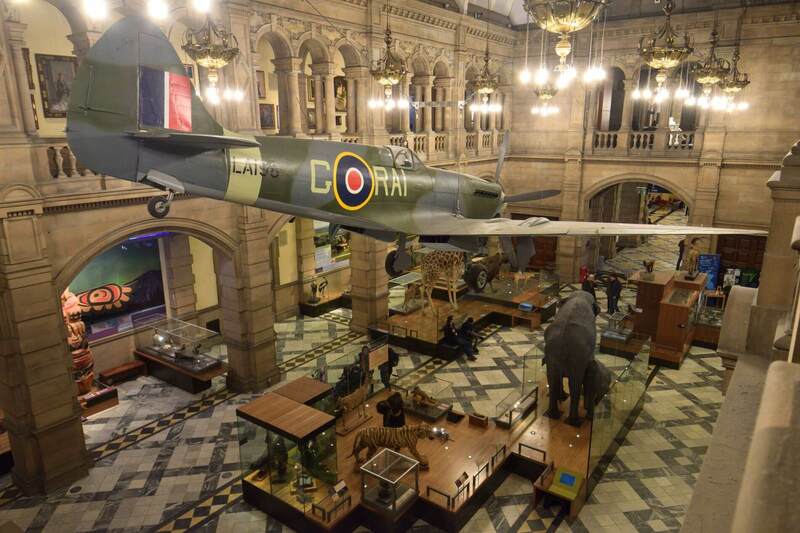 The museum is about the history of Glasgow and its people. 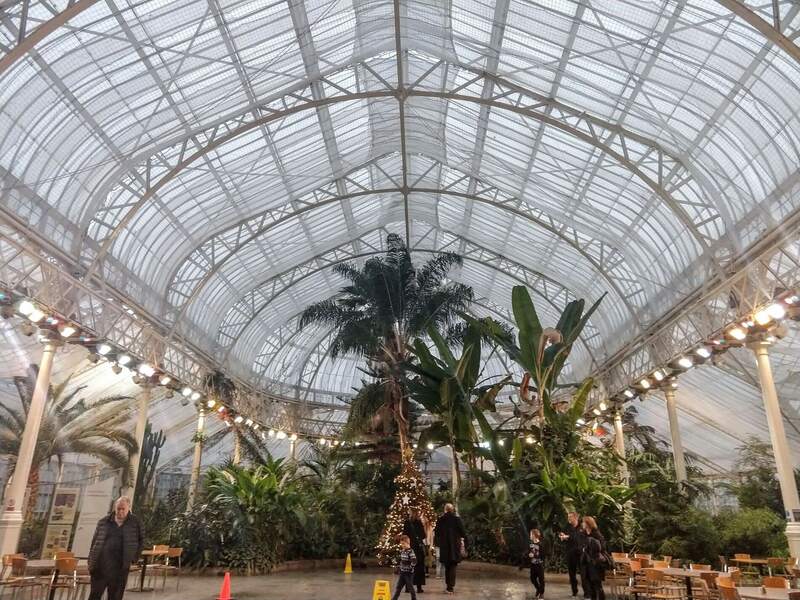 In the back is a wonderful enclosed Winter Garden with all these tropical plants. A nice place to get out of the wind and rain a few minutes. They have a cafe inside too! We found this by accident really, even though I knew Glasgow had this somewhere. When we were driving to find parking in the cathedral district, we went down George Street and saw quite a few. On the way back to the car from the People’s Palace, we went down this road to get photos. Some of them are so realistic! 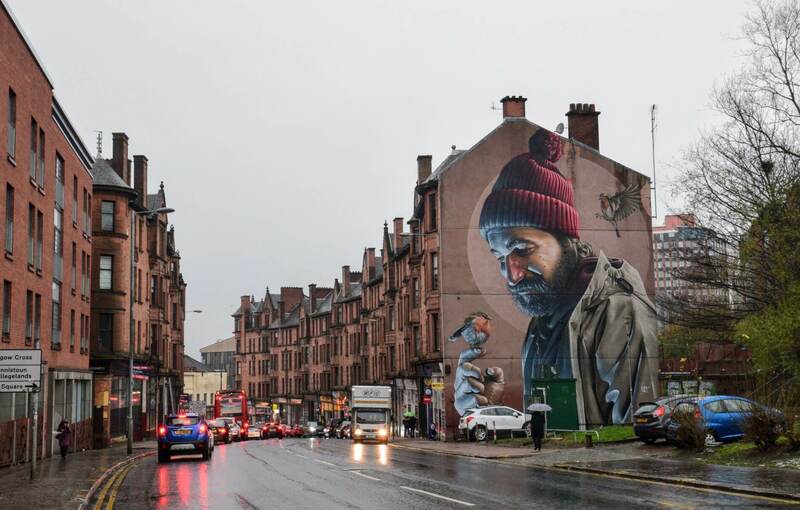 One of them is the Glasgow High Street Mural by an Australian artist called Smug. 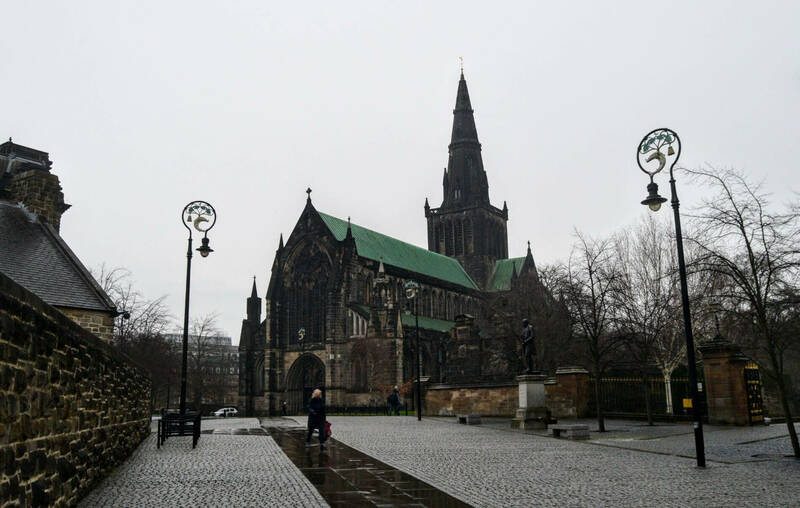 It’s a modern St. Mungus, which Glasgow Cathedral is also known as St. Mungus Cathedral. For more on areas for street art tour, check this out. 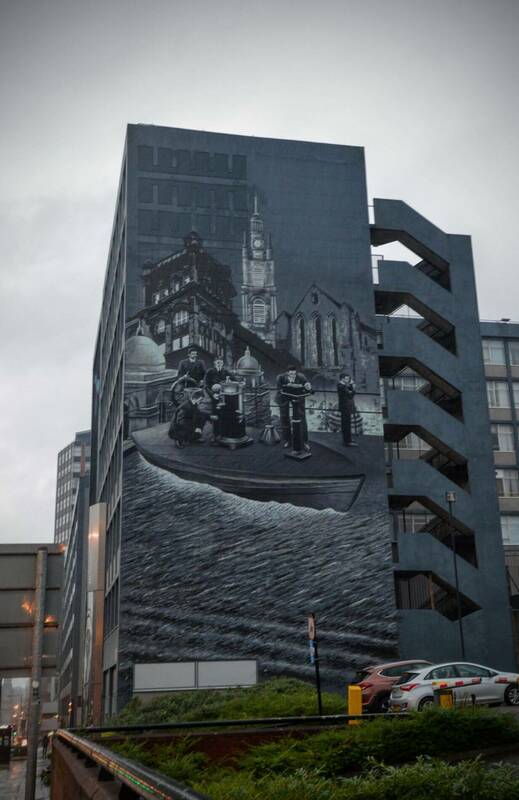 After walking in the rain to see the street art on George Street, we made it back to our rental car. We decided to drive by the next few sights which are located on the River Clyde. 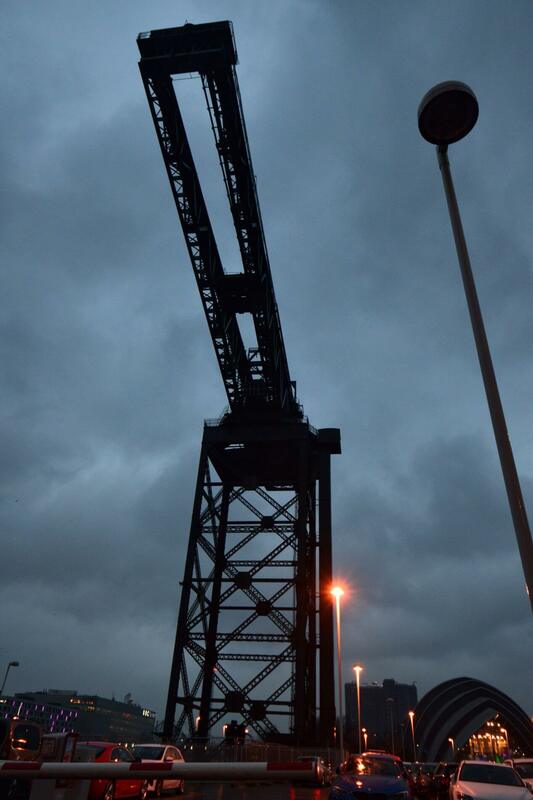 First is the Finnieston Crane, a giant cantilever crane that is no longer working but remains as a symbol of Glasgow’s engineering history. The second thing we drove by was the SEC Armadillo, an auditorium which holds different types of events. It got its name from resembling an armadillo. Seriously come by here, another amazing building, and yet another free place to visit! We stayed over an hour here, and left only because they were closing at 5pm. Displays of animals (some of which are extinct), an Egyptian section, a huge organ in the center, a Spit Fire plane hanging from the ceiling, and lots of exhibitions. Everyone is bound to find something that interests them inside. It was already dark, but I read about these two Christmas markets in the city that I didn’t want to miss. I’m glad we went here because, it showed us an area with lots of modern shopping stores, Christmas lights, and it was a centralized area full of life. 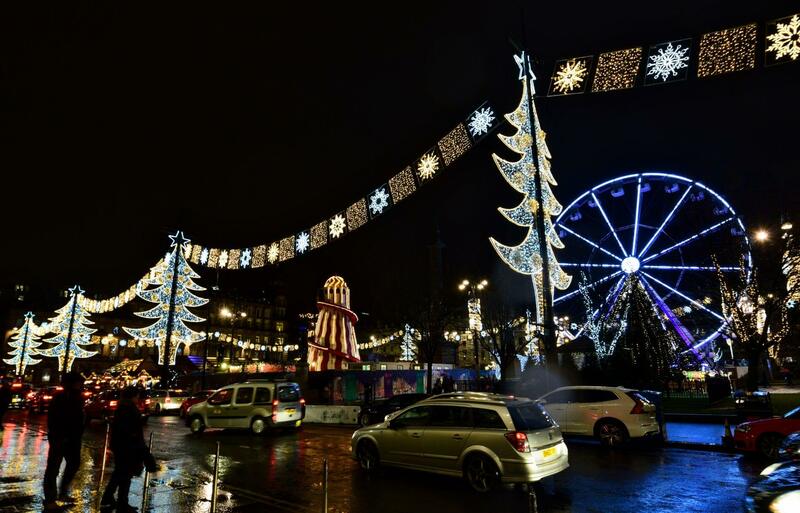 We got dinner at the market at St Enoch’s Square and then walked by the rides and lights at George’s Square on the way back to the car. Parking in the center was difficult to navigate because there were many one-way roads and some that only buses and taxis could go on. All in all, Glasgow has a different vibe than Edinburgh. It was cool to get to check out for a few hours. What do you know about Glasgow? 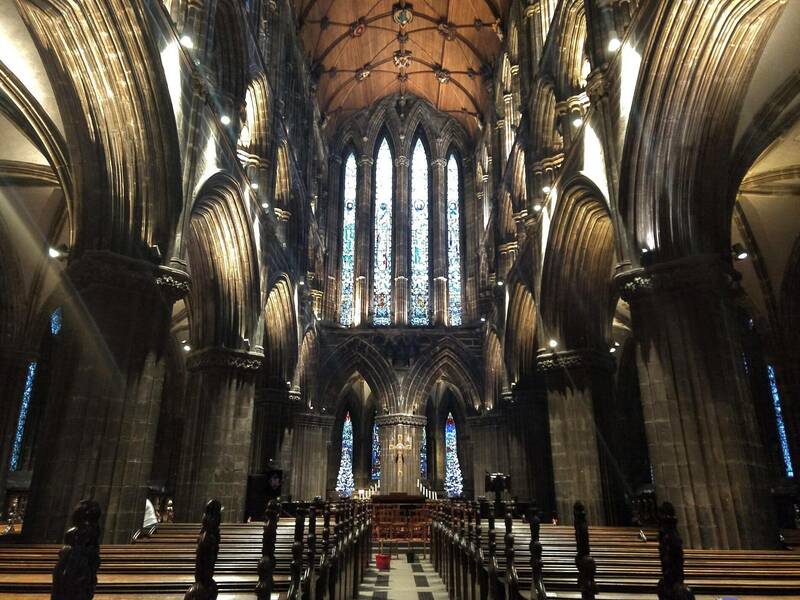 Would you visit Glasgow on a visit to Scotland? Let us know! If you are traveling, don’t forget travel insurance! We use World Nomads for our needs. Also don’t forget to follow us on Facebook and Instagram.